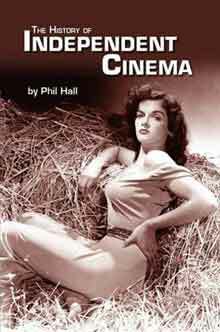 In his characteristically breezy and conversational tone, Phil Hall deftly covers a lot of territory in his ambitious The History of Independent Cinema. The book, Hall’s third on film, reads less like a stodgy college film history class and more like a late-night rap from a visiting lecturer at the local arthouse cinema. To cover the entire history of independent cinema is probably a nigh impossible task, so rather than present a strict timeline of filmmaking events, Hall structures his chapters around significant movements within the overall history. Hall begins literally with the birth of cinema and documents the machinations of Thomas Edison to keep a tight reign over his invention and the machinations of Carl Laemmle and Adolph Zukor to develop an end run around him. But, as Hall proclaims, the real birth of the modern-day independent film movement began with D.W. Griffith and the production of his controversial Birth of a Nation (1915). Hall considers Birth a defining moment due to Griffith’s strategy of raising funds for the project himself after becoming frustrated with his previous work-for-hire situation for the Biograph studio and a botched relationship with the Mutual Film Corporation. Also covering the early silent days of cinema, Hall goes into detail about Griffith’s alliance with Charlie Chaplin, Douglas Fairbanks and Mary Pickford to form United Artists, which became successful despite major failures from the founding principles. This section is also where Hall begins to focus on interesting subcultures within the grand history of independent cinema. For those who think that the 1939 film version of The Wizard of Oz was the first adaptation of L. Frank Baum’s famous creation, Hall provides a lengthy section on failed previous, largely unsuccessful adaptations overseen by the author himself, who died in 1919. Yet, Baum’s efforts are described by Hall as the first attempt at an independent film franchise. Hall opens Chapter Two, “Parallel Worlds,” with profiles of the more successful and well-known names in the early days of independent film producing: Samuel Goldwyn, David O. Selznick, Howard Hughes, Hal Roach, William Randolph Hearst and Walt Disney. These profiles are followed by more interesting, and less well-known, subcultures including the so-called “race films;” i.e. films made by black producers specifically for black audiences; Yiddish-language films; and “exploitation films,” such as the endearingly popular Reefer Madness. Chapter Three, “New Directions, New Horizons,” slams together technical accomplishments in the indie film world; such as 3-D, Cinerama and 70mm film; along with career profiles of pioneering directors such as Frank Capra, Orson Welles, Stanley Kramer, Ida Lupino, Otto Preminger, Morris Engel and John Cassavetes. There’s also a brief overview of the tradition of horror filmmakers, like George Romero, breaking new, taboo ground within the indie scene; and some examples of famous indie filmmakers who have gone on to also create successful work in the studio system: Martin Scorsese, George Lucas, Terrence Malick, John Carpenter, the Coen brothers and more. Hall also does include a history of the underground film movement. For underground fans, Chapter Four is a nice companion piece — prequel-ish, if you will — to Hall’s earlier tome, The Encyclopedia of Underground Film. Hall marks the beginning of the underground with Charles Sheeler and Paul Strand’s little known Manhatta, an abstract 10-minute portrait of New York City’s architecture. Then, after covering early avant-garde pioneers such as Dudley Murphy, Robert Florey, Ralph Steiner, Willard Van Dyke and more, there are longer profiles of the more famous underground figures. There’s a very nice, lengthy overview of the career of the highly influential Maya Deren, as well as good coverage of peers such as Kenneth Anger, Stan Brakhage, Andy Warhol, Shirley Clarke, Jack Smith and Jonas Mekas. Hall concludes his underground overview with a proclamation of “Today’s Top 20 Underground Filmmakers.” While some filmmakers on the list are obvious, e.g. Craig Baldwin, Martha Colburn, Nick Zedd and James Fotopoulos, others are more puzzling, like Eric Stanze, Thomas Edward Seymour, Jimmy Traymor and others. This isn’t to put down anybody on the list, but Hall earlier defines “underground” as being synonymous with “avant-garde” and “experimental,” yet many of the underground filmmakers on the Top 20 list sound as though they simply make low-budget genre films. Of course that might be just because I’m not personally familiar with their work. There’s a ton of great information in The History of Independent Cinema presented in a highly entertaining fashion. The only thing I wish this book had also included, particularly because there is so much information inside, is a collection of endnotes or footnotes of its sources. I found Hall’s effort to be so engaging that when I was done, I felt inspired to find out even more about many of the films, filmmakers and subcultures that I had been previously unaware of. Buy The History of Independent Cinema on Amazon!